Im on Borneo again - and every time there are new species of the many orchids, pitcher plants and animals for me to discover. This time we found a Borneon Horned Frog. Long time on my wish list ;). Common but not easy to find because its so well camouflaged to the leaves on the forest floor. It is a stocky frog with arms and legs that appear almost too slender and weak for that size of a frog. 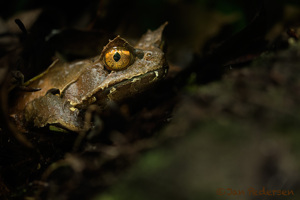 It is a forest floor ambush hunter waiting for big insects, snails and possibly other frogs coming within reach of its tongue.